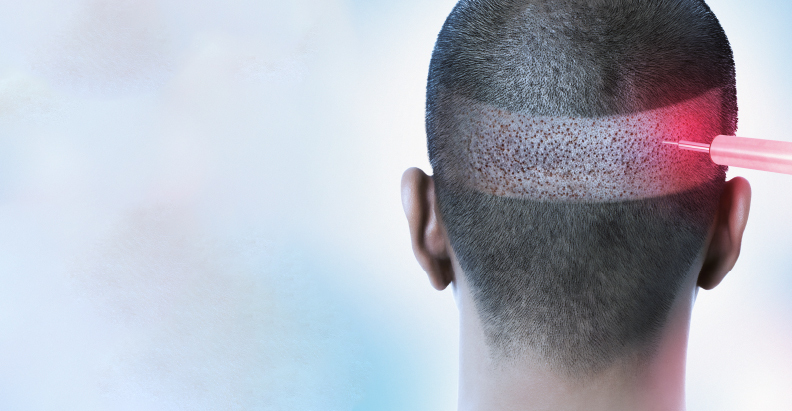 Maria Bonnici reviews the current mainstream and alternative treatments for male pattern hair loss, including hair transplants, oral finasteride, and low-level light therapy. Androgenic alopecia (AGA) or male pattern hair loss is the most common cause of hair loss in men and it is affected by genetic and environmental influences1,2. It affects all races but it is more common in Caucasians with a lower prevalence in oriental races3. All studies demonstrate a gradual increase in incidence with advancing age1,3–4. AGA affects 50% of men between the ages of 40 and 49 years1. AGA causes significant psychological distress and it is one of the most common reasons for dermatological consultations leading to newer modalities and treatments being researched for its cure5. This article aims to look at the causes of AGA in men and the current mainstream and alternative treatments for this common cosmetic disorder. In men, AGA develops with a distinctive patterned hair loss, but occasionally, men develop a female presentation, which has a less distinctive pattern. The most accepted method of classification is the modified Norwood-Hamilton classification which consists of seven groups and four specific different types of variants (Figure 1)6–7. Hair loss is induced via activation of androgen receptors in hair follicles by dihydrotestosterone (DHT). In men, there is an elevation of type II 5-alpha reductase enzymes, which metabolise testicular testosterone in the blood to DHT8–9. The binding of DHT to androgen receptors in hair follicles leads to a progressive shortening of the anagen (growth) phase with a prolongation of the telogen (rest) phase of the hair follicles. This replaces thick, pigmented terminal hair into fine, non-pigmented vellus hair9. AGA is also influenced by environmental factors, that lead to follicular micro-inflammation and fibrosis10. This can be triggered by microbial toxins (related to Propionibacterium sp, Staphylococcus sp., Malassezia sp., or Demodex sp. ), oxidative stress11, and microscopic flora like seborrhoea. Unlike in scarring alopecia, this process is slow and indolent10. The ageing process, smoking12–13, UV radiation14–15, and other pollutants may also play a role in hair loss. All the above environmental factors lead to the formation of free radicals, which are no longer adequately scavenged by the cell’s defence mechanism resulting in damage to the hair follicles. AGA has a polygenic mode of inheritance16 and this is established due to the high prevalence and the widely expressed phenotypes. The two major genetic risk loci are on the X chromosome (AR/EDA2R locus) and the PAX1/FOX A2 locus on chromosome 2016. Oral finasteride (Propecia, Merck Sharp & Dohme Corp., NJ) and topical minoxidil (Rogaine®, Johnson & Johnson Consumer Inc.) are the only two therapeutic agents approved to date by the Federal Drug Administration (FDA) and the European Medicines Agency (EMEA) for the treatment of AGA1. Oral finasteride, a 5-alpha reductase inhibitor at 1 mg a day, is the recommended dose for AGA in men over 18 years of age and it is the treatment approach used most often17. It is a synthetic drug that reduces the conversion of testosterone to DHT. Its effect on hair count and thickness is often experienced at 6 months with the maximum effect at 12 months18. Some rare but important side-effects with oral finasteride include reduced libido, erectile dysfunction and gynecomastia. It was also found that finasteride decreases prostate specific antigen (PSA) levels and it is therefore recommended that PSA levels should be monitored in patients aged over 45 years19. A large prospective study as part of The Prostate Cancer Prevention Trial (PCPT) showed that participants who received 5 mg during a 7 year period experienced a minimal increase in sexual dysfunction and its impact diminished over time. 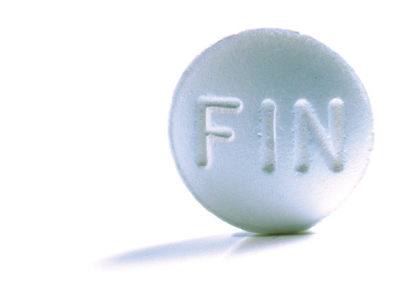 The authors concluded that since the side-effects are minimal it should not limit physicians to prescribe oral finasteride20. Dutasteride is more potent than finasteride, working by inhibiting both type I and type II 5α reductase. Type II 5α reductase is more concentrated and therefore, the additional inhibitory effect could yield a greater clinical effect. Phase 1 and 2 trials in men have shown that dutasteride suppresses 100% of serum DHT (dose 2.5–5.0 mg/day), whereas finasteride suppresses only 70% (dose 5mg)21. Despite this, sufficient evidence is still lacking. Minoxidil is mostly available in 2% and 5% and its use is associated with increasing vasodilatation, enhanced cell proliferation and angiogenesis. The 5% solution was found to be more effective and the standard formulation, which contains propelyne glycol is preferred as the alternative preparations lack sufficient scientific evidence of their efficacy22. Side-effects of minoxidil include hypertrichosis, contact dermatitis and transient shedding in the first four months, but the commercially available foam vehicle does not contain propelyne glycol, therefore, reducing the incidence of pruritus23. Studies in both animals and humans have shown that the combination of minoxidil and oral finasteride are far superior than minoxidil and finasteride monotherapies24–25. A recent double-blinded study compared the efficacy and safety of 3% minoxidil (MNX) against combined 3% minoxidil/0.1% finasteride lotion (MFX). At 24 weeks, hair count was increased in both groups, but the MFX group showed significantly greater improvement in global photographic assessment than the MNX group26. The prostaglandin F2α analogues bimatoprost and latanoprost are used to treat glaucoma and ocular hypertension. One of their side-effects was found to be eyelash hair growth and thus bimatoprost is now available to promote eyelash hair growth27. In a study, latanoprost had been found to significantly increase hair density and encourage pigmentation when compared to baseline28. Ketoconazole 2% shampoo, an imidazole anti-fungal agent, is commonly found over the counter and it is used for the treatment of dandruff and dermatitis. It could also help those with AGA-associated follicular inflammation29–30. Moreover, it is also an anti-androgen and could improve hair growth in AGA through androgen dependent pathways31. Hair transplantation is the most common hair restoration surgery used for AGA. Its principle revolves around hair donor dominance, where androgenic insensitive hair follicles keep their properties when transplanted into scalp areas affected by AGA. This could be used in those who have sufficient donor hair sites. Studies have found that the combination of oral finasteride and hair transplantation yields the best results32–33. The safe donor area is a horizontal area in the occipital region. There must be at least 40 FUs/sq cm in the donor area. Hair is harvested by using either the follicular unit extraction or the strip method or a combination of the two. The grafting of follicular units is now considered the optimum method22. Local side-effects include post-operative bleeding, infection, swelling, facial oedema, scalp erythema, crusting, temporary headaches and numbing of the scalp and abnormal scarring of the graft34. For a few weeks after the procedure, temporary telogen effluvium can occasionally occur in densely packed grafts, but could be minimized or prevented with the application of minoxidil solution applied twice daily to both the recipient and donor areas for 1 week before and 5 weeks after the operation35–36. Hypertrichosis has been recognized to occur as a side-effect with low fluences and all laser types. It could be due to sub-optimal fluences that are too low to induce thermolysis, but high enough to stimulate hair growth37. The level of evidence in using phototherapy in AGA remains poor and there are also some safety concerns. Moreover, the optimum wavelength, coherence and dosimetric parameters remain to be determined38. 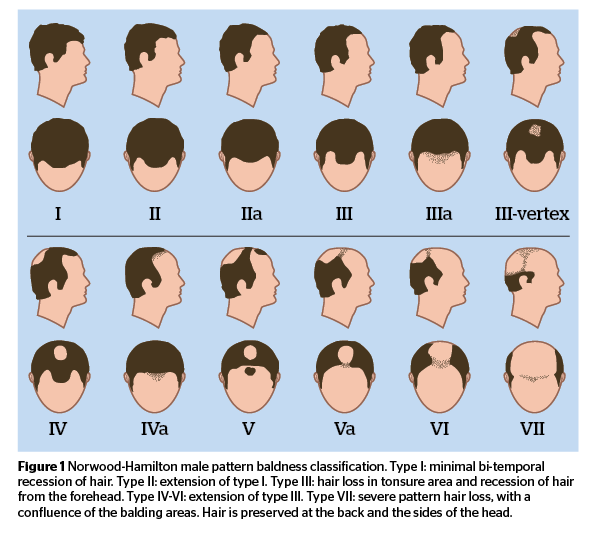 In a 26 week randomized, double-blind, sham device-controlled, multicentre trial, 110 males with Norwood-Hamilton classes IIa-V AGA used HairMax® LaserComb (Lexington Int., LLC, FL) or a sham device. Participants in the HairMax® LaserComb device exhibited a significantly greater increase in mean terminal hair density than participants in the sham device39. Another double-blind study using a home device with 630, 650, and 660 nm wavelengths for 18 minutes daily showed significantly greater hair density and mean hair diameter than a sham device40. For those men who opt for a watch-and-wait policy, tinted cosmetics, hair lightening, and adequate hair styling may help to camouflage the defect. Hair extensions or hair pieces may also cover the scalp. Prosthetic implantation of synthetic is not recommended anymore as this is associated with a high number of side-effects41–42. A 60 week study included 50 males between 19 and 57 years of age with Norwood/Hamilton ratings II to IV were injected with 150 units of botulinum toxin type-A (BTX-A) into the muscles surrounding the scalp in equally divided doses. This study concluded that there was a statistically significant increase of hair count (18%) between baseline and week 48. Hair loss was also reduced by 39%. The conversion of testosterone to DHT is favoured in a low oxygen environment whilst in high oxygen environment DHT is converted to estradiol. By injecting BTX in the peripheral musculature one achieves decompression of the perforating blood vessels through relaxation of the musculature involved and simultaneous increase in oxygen delivery to frontal and coronal areas of the scalp43. Research in this area is still in phase I or II clinical trials. Cultured cells or the use of cell secreted factors can be injected directly into the hair follicle and promote hair growth. Cells from the hair follicle mesenchymal tissue can be cultured and then used to promote new hair follicle formation from epithelial tissue. Another approach is that cells are cultured and the supernatant is processed to produce compounds such as Wnt proteins that are rich in hair growth promoting factors44–45. Platelet-rich plasma (PRP) isolated from whole blood is gaining popularity in the cosmetic field and it is one of the latest methods of treatment for various types of alopecia46. In a recent study conducted on 11 patients not responsive to 6 months of treatment with minoxidil and finasteride, PRP demonstrated a significant reduction in hair loss between the 1st and 4th injection given with a negative pull test in 9 patients47. PRP injection could be a simple, cost effective and feasible treatment option for androgenic alopecia. Products containing different blends of vitamins, mineral components and herbs are often marketed to consumers but lack sufficient supporting data for their efficacy. Common marketed herbs include black cohosh (Actaea racemosa), dong quai (Angelica sinensis), chaste berry (Vitex agnus-castus), false unicorn (Chamaelirium luteum) and saw palmetto (Serenoa repens)19,48. The purified extract of Serenoa repens contains around 90% fatty acids and sterols, with an abundance of tannin, carotenoids, lipases, sugars, and fatty acids such as palmitic acid, oleic acid, caprylic acid, and beta sitosterol. The combination of saw palmetto’s liposterolic extract and beta sitosterol has been claimed to provide improvement in AGA but evidence is lacking49. A two year study compared the effectiveness of finasteride versus Serenoa repens in male AGA. It showed that while Serenoa repens could lead to an improvement of AGA, finasteride confirmed its efficacy. Finasteride was shown to have an influence in both the vertex and the front area, whilst Serenoa repens was mostly effective on the vertex50. Caffeine is a phosphodiesterase inhibitor. Therefore by increasing the cAMP, cell metabolism is promoted; a mechanism which would counteract testosterone/DHT-induced miniaturization of the hair follicle51. An in vitro study demonstrated that caffeine acts as a stimulator of human hair growth and this may have an important clinical impact in the management of AGA52. 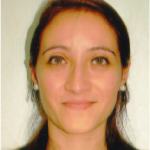 AGA can be a significant psychological issue to most patients and it is one of the most common dermatological complaints for which patients seek treatment. It is of utmost importance that physicians especially dermatologists understand the physiological process and the available methods for its management to be able to help patients in the most effective way. Blumeyer A, Tosti A, Messenger A, Reygagne P, Del Marmol V, Spuls PI, et al. Evidence-based (S3) guideline for the treatment of androgenetic alopecia in women and in men. J Dtsch Dermatol Ges 2011;9:S1-57. Uremia S, Umar SH, Li CH. Prevention of temporal alopecia following rhytidectomy: the prophylactic use of minoxidil: a study of 60 patients. Dermatol Surg. 2002;1:66–74. I am Leonard Stillman, Director of Professional Services at Lexington International, LLC, manufacturers of the HairMax LaserComb. This post is NOT for commercial purposes, but is to notify readers of a landmark clinical paper that was published in April 2014, in a peer-review medical journal, The American Journal of Clinical Dermatology, and authored by some of the leading authorities on hair loss treatments. The clinical paper also found that short term results of the clinical trials with the HairMax LaserComb were comparable to those found in clinical trials with minoxidil [Rogaine] and finasteride [Propecia). The HairMax laser devices have been used by over half a million men and women to treat their hair loss. And, the HairMax laser devices are routinely recommended by dermatologists for the treatment of hereditary hair loss. We have recently introduced a hands free device, the HairMax LaserBand with super-fast treatment time in as little as 90 seconds, three times a week. We invite your readers to visit our web site, http://www.hairmax.com, where they will see a description of all the HairMax laser devices to see if they are right for them.